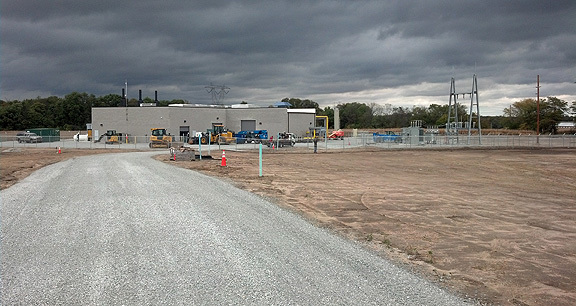 Project obstacles and solutions: The County Line Landfill in Argos, Indiana has become the site of a renewable energy project that uses methane gas to power an electrical generating plant. Republic Services operates the landfill. They partnered with Aria Energy to design and operate the gas-to-energy station adjacent to the landfill. Decomposing waste produces methane gases. These are extracted and processed into a liquefied methane-diesel before being piped to three generators operating at the new facility. Electricity from the generators is then sent down the local power grid. IES was the general contractor for this project. A key to the construction of the generating facility was the substructure. The generators have 24 cylinders per unit. These cause considerable vibration when they are operational. To counteract the vibration, the slab bases for the generators were set on an 8 foot pit filled and compacted with No. 53 limestone. The interlocking nature of the stone provided a firm base for the 2,200 square foot facility. Placing 8 feet of stone under a building is overkill for most projects, but the depth of compacted stone absorbed and dispersed the shaking of the machinery. This would not have been as effective with compacted soils. IMI Aggregates supplied 25,000 tons of stone that was delivered and placed in one week. The County Line Landfill generators are capable of producing six megawatts of energy. That will power over 3,200 homes. The Argos project was the 74th gas-to-energy project Republic has built on their landfills. For more information on the use of stone for a sub-base material, contact the sales representative the for the IMI Aggregates location nearest you. Click here to see our locations.